Makes changes to existing shouts to make them more balanced for PerMa. Do anything you want with it. You must give props to the people that are in the credits and cannot claim you made this. First word now grants 15% increased physical, fire and frost damage. Second word now reduces physical, fire and frost damage taken by 20%. Third word grants secondary effects to other shouts. No longer designed for use with SkyRe. Unofficial Patches aren't masters anymore. Wyrms are now invulnerable and move 40% faster. 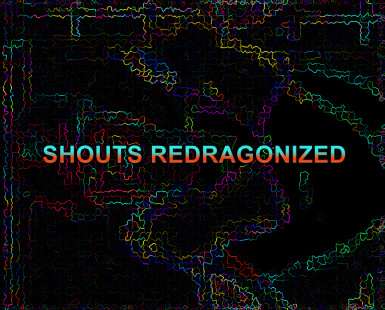 Renamed to "Shouts Reloaded - designed for SkyRe and PerMa"
This mod modifies existing shouts, making them more balanced for PerMa. OR IT THINKS IT DOES. DUN DUN DUN. The last version that officially supports SkyRe is 2.1, anything newer than that will make certain shouts overpowered and elemental fury useless. Requires Dawnguard, Dragonborn and all the Unofficial Patches. 2b. Extract in your \Skyrim\Data folder. An extremely situational shout, I was almost tempted not to change anything about it. The main goal was to make the first word have a low cooldown so you can shout more frequently. Words add duration and lock you out of shouting for more time. One word avoids frequent bursts of damage, two words allow you to reposition and/or regenerate, three words = get out of jail free card. Become Ethereal also turns you invisible for 5 seconds. Now steals stamina, magicka and/or health. Also increases Fire Resist by 10%. Now restores 40/80/140 health and stamina. If you spot a bug or have questions/suggestions leave a comment. It should be "compatible" with any mod that doesn't mess with any of the above. If you have other mods that do the one closer to the bottom of your load order will prevail over the others.